Double-backed straps are the safest way to secure your backpack. Safety is the number one concern while backpacking. 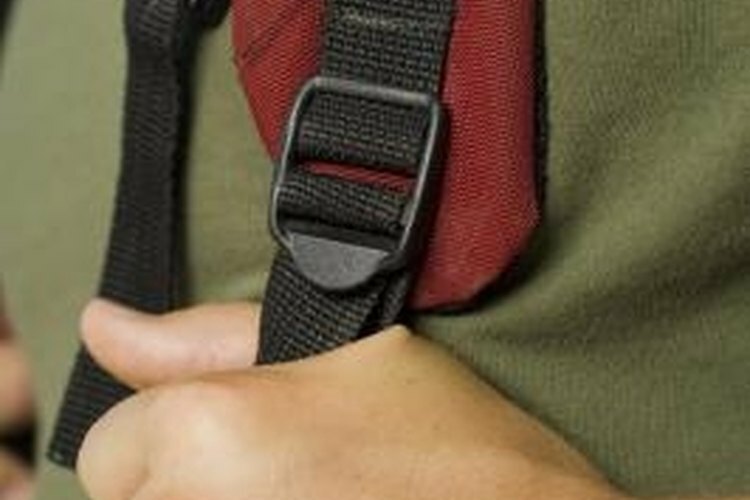 You must ensure that your backpack is correctly buckled and fastened to prevent injury while hiking. Most backpacks come with the straps already safely attached. Beyond setting up the straps correctly, the backpack itself must be in good working order. Check for wear and tear, holes, broken pieces and malfunctioning zippers. You can easily learn the technique used to secure the straps -- you should memorize it before beginning your trip. Pull the end of the nylon strap through the part of the plastic buckle closest to the end that opens. The end should be inserted through the back of the buckle with the end facing away from the body. Double-back the end and loop it through the hole the strap just came through, ensuring that the pieces of strap are next to each other. The friction of the straps against each other prevents slipping. Pull the end away from your body and feel the straps tightening the backpack around your body, whether it be the hip belt or sternum strap. If the strap loosens after being tightened, you might need to replace the straps, also called webbing. Always take extra buckles and straps in case a part of the bag breaks while on the trip.